Think about all the benefits that being organized can offer you, both personally and professionally. Being organized can help reduce stress, give you more time to do the things you love like spend time with your family, improve your health and improve your business productivity. 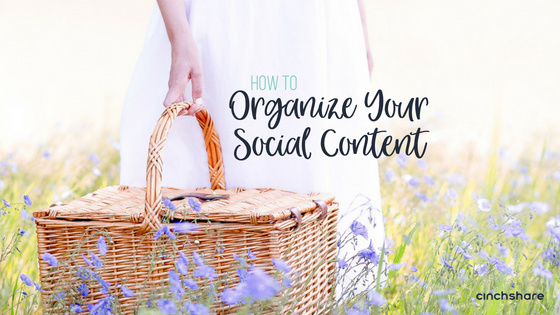 The big question is: How do you organize your content online? You’re in luck because today we have the answer for you! Folders! Once you are organized using folders, gone will be the days of maxing out your space on your phone’s camera roll and saving images to your computer only to never find them again in that seemingly infinite black hole. 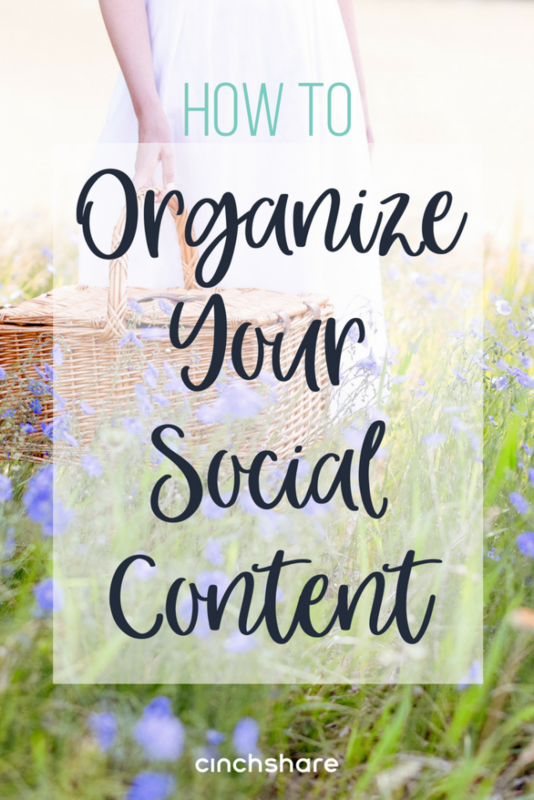 Getting your social content organized will help you save time, reduce stress and make you more consistent in your business! It will also help you grow your personal sales, team sales and grow your overall team size! Team Folder to help your downline rock their social media! Once you have created your folders and put images inside them, you can share the folders with any other CinchShare users just by following a few quick steps! 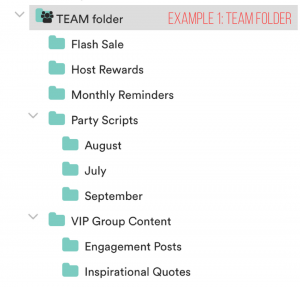 For example, you could create one Team Shared Folder and add all of your content to that folder. You can even take it one step further and organize the content into sub-folders and your team members in the folder would receive real-time updates. You could also manage your shared folder like you do your Facebook Group. Think of it as a collaborative workspace for your team. Just like managing your group where you get to share content to your FB group, you can now manage your Shared Folder in CinchShare the same way. You can assign others to be an admin to help you manage the content. Admins will be able to add posts, edit posts, organize posts and delete posts. As an admin, you’ll have full control and can even block certain users if your content was shared to someone it shouldn’t have been. To get you started with Folders, we would love to share our CinchShare Freebie Graphics folder with all of you! The folder has sub-folders of theme parties, CBA shareable posts, engagement posts, etc. *Remember, you have to opt-in to the upgraded post library to join the folder. As the owner of the Shared Folder, you have the ability to assign roles inside the folder. You determine who has Read Only Access, Admin Access, or Block, giving you full control. Read Only access – Everyone has Read Only access when they first join the folder, which means they have access to the posts inside the folder, but they cannot change anything inside the folder itself. Admin access – You can make someone an Admin in the folder. As the Admin, they will be able to add images and content to the folder too. Block access – You also have the ability to someone’s block access to the folder at any time. Now that you have your folders set up, you can easily schedule your posts from your folders, batch your posts from a folder or you can save posts to a folder to schedule later. And no worries if you forgot to categorize posts you scheduled or saved. You can easily organize them into the folders you’ve created. This video will show you how simple it is to save a post or image into your folder! With the Bulk Photo Upload feature, you can now upload as many photos as you want in seconds! If you have multiple photos on your phone that you know you want to incorporate into your business to show your personal side, you can now upload them all in one simple step! If you have a bunch of photos saved in a file on your computer to use, you can now easily add them all into your CinchShare account and finally get them scheduled and posted just like you have always wanted to! Your phone and computer will thank you. You can also move or copy images inside folders. If you Move posts, it will take them from one folder and moves them over to another folder. If you Copy a post, you can copy the post over to another folder and it will remain in the original folder too, you are making copies. You can also Drag and Drop single AND multiple posts or Copy/Move posts from Menu (and multiple posts) into Folders. Drop mic! How about another awesome shared folder to join?! If you are a CinchShare Brand Ambassador, click on this shared folder to have instant access to ready-made posts available at your fingertips so you can schedule to Facebook, Instagram and Twitter to help you easily share the #cinchlove! We included helpful blog posts, reviews and quotes that you can share with your team so that they can better understand both social media and CinchShare. Getting to know, like and trust is a powerful tool when it comes to social media and we want you to be prepared to WOW your team and friends! Not a CBA yet? You can join HERE for free! 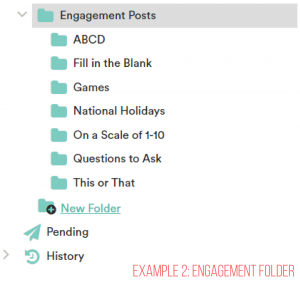 We hope you have a great time creating and organizing your social content with CinchShare’s Post Library Folders! Be sure to share this blog post with your team and friends so they can start sharing content with you too!